The car is powered by a 90kWh lithium-ion battery that has a range of up to 470km from a single charge, ensuring you’d never run out of power on a daily commute, or worry about “range anxiety” unless travelling long distances. When I drove the I-Pace on Johannesburg’s roads, it was smooth, comfortable and silent — almost calming. From the silence at start-up to instant torque delivery and one pedal driving, it’s a very different driving experience. Then there’s the whole charging aspect, but more on that later. Having previously driven the two other EVs available locally, the Nissan Leaf and BMW i3 (does the hybrid i8 count? ), I can finally say I’ve become used to starting up an EV to complete silence. For anyone getting their first taste of an EV, the lack of an engine sound is something that will take a bit of getting used to. As with all EVs, torque is delivered instantly — there are no gears or worrying about RPMs. The I-Pace has an output of 294kW and 696Nm of torque, and if you’re not careful, you could easily unintentionally misuse the maximum torque. Having all this power on tap makes the I-Pace immense fun to drive, and I have to admit I enjoyed overtaking — and did so more than necessary. Interestingly, after getting into a fully charged I-Pace with the air-conditioner on full blast, it displayed a range of 256km. I knew it didn’t look right so I turned off climate control, and the range immediately went up to 426km. Driving efficiently is key to getting the best range out of the vehicle, which brings me to one-pedal driving. You can extend the range of the vehicle with regenerative braking by taking your foot off the accelerator, which automatically slows down, without touching the brakes. This process turns the forward motion kinetic energy into electricity to charge the battery. In the long run, this preserves your brake pads if you don’t use the brakes as often. The I-Pace has a high and low setting for regenerative braking, and if you’re using it on high it is immediately noticeable as slowing down is more aggressive than the low setting. To pull it off seamlessly in Jo’burg’s traffic, it requires some practice to get the timing right. 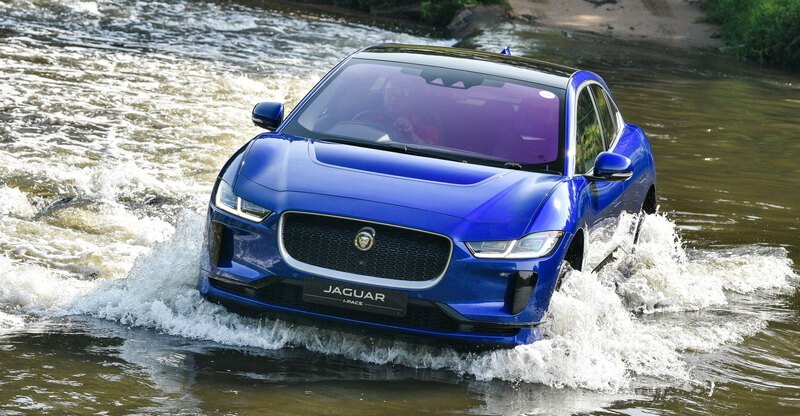 After driving through various landscapes within Gauteng, both on and off-road, including a 4×4 track at the JLR Experience Centre, the I-Pace proved it could handle any terrain, even wading through the mucky Jukskei River. It was novel taking an electric car through water, but if I were to own the I-Pace, I’d rather drive it on good urban roads. 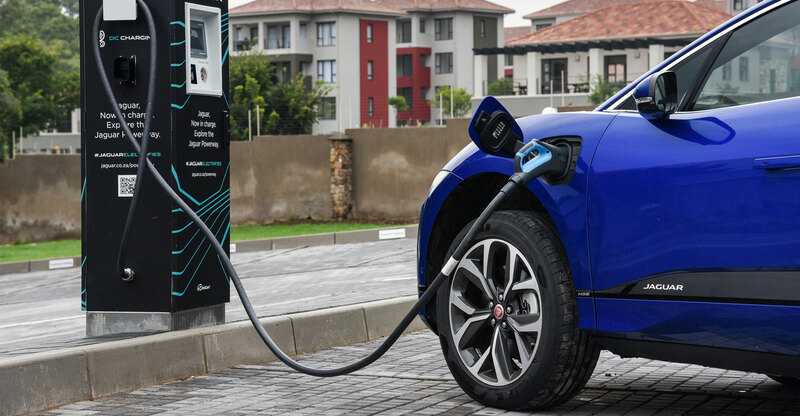 Jaguar South Africa has rolled out 82 public charging stations across the country, which can also be used for any other electric vehicle with a type-2 connector. These AC/DC combination chargers are at dealerships and shopping centres around major hubs in Johannesburg, Cape Town, Durban, Pretoria, Port Elizabeth, Bloemfontein and East London. Long-distance travel between cities is also possible through 52 charging stations. These stations are a network that Jaguar calls the “Jaguar Powerway”. It allows travel between Johannesburg and Durban, and Durban and Cape Town via the Garden Route without worrying about an empty battery. The I-Pace can be recharged with a 22kW AC charger, taking it from 0-80% in two and a half hours, and a 60kW DC charger does the same job in 72 minutes. The 7.4kW home chargers (available separately) takes just under 13 hours for a full charge. The idea is to charge it overnight at home, and using a smartphone app, one is able to select a time for it to be ready. 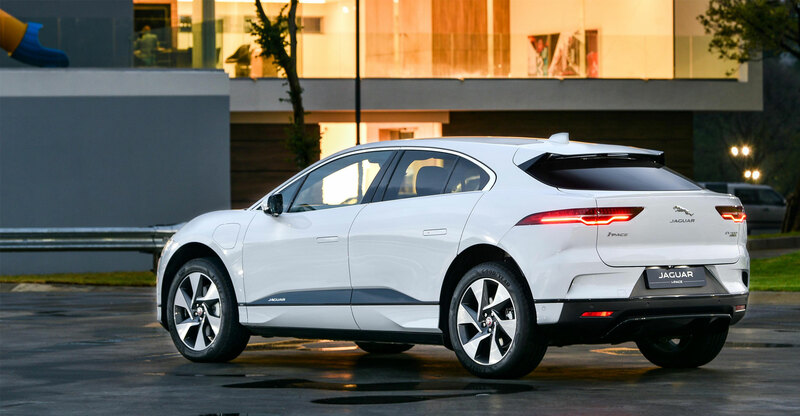 Customers who purchase an I-Pace will have 25% of their electricity bill covered by Jaguar South Africa through the RFID card that is used to recharge the vehicle. The card is used to start and end a charging session at any location, even at home, which also makes it tamper-proof. It goes without saying that purchasing an EV in South Africa right now appeals to a very niche market, given that pricing is subject to a 25% import duty.